(Newser) – They're not out of the woods—or, more accurately, out of shallow Everglades waters—yet, but rescuers now believe dozens of whales stranded in Florida have a good chance of survival. 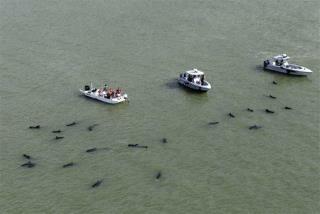 The surviving 35 pilot whales from the stranded pod are slowly moving toward deeper waters, nudged along by rescue teams using "gentle herding" techniques to get them away from the lethally shallow, sandbank-crossed waters where 11 of them perished and another five are missing, reports USA Today. You know: NO one here is discrediting anyone for their efforts to save a whale etc...but what really chaps my backside is when I and many others go out to the highways and byways in many cities the Police etc almost always tell us "YOU can't preach on the streets" You need a permit etc...and they give preachers a hard time! Yet these same, I am holier than thou people will d\go to the moon and back and spend so much money for a whale that probably went to the land to die anyway, and to hell with the souls of men! That is the problem w/the world and this country today, most people don't give a rip about your soul etc they just care about some stupid whale that will die and rot or be eaten! the souls of mankind will die and go straight to hell, w/out Jesus Christ as "SAVIOR"!! 1 Peter 3:18 KJV I care about the souls of men and MOSTLY, so does Jesus Christ! I am VERY glad to see that NOAA is running this operation. Truly. Because the Florida Fish & Wildlife Commission would have killed them all immediately. Don't think so? Look at how they handled the bear attack near Orlando. Before even getting the DNA results back on the bear they think did the mauling, they killed it. They said public safety is their number one consideration. Just because the bear was in the area. I guess they never heard of the term, "relocation". There are hundreds of bears in Florida. Are they going to kill every one that is seen? Probably. Then they complain when a species is wiped out. When there REALLY is a threat, like the Pythons in the Everglades, that have now eaten OVER 90% of all of the small animals that USED to live there, Florida does nothing. Nearly every animal is GONE. No more raccoons or anything else small enough to fit into a pythons mouth. Even small alligators are eaten. And nothing can kill them. A large snake even ate a big alligator. That picture on the Internet was real. There are now over 150,000 pythons and the number of course keeps growing. All in a matter of a maybe 5-10 years. AND, they are moving down to the keys and up into typically cooler areas of Florida. Your car gets a flat tire on the highway? You might get eaten by a big snake when you go to change it. "Hope Spouts " Really, Rob? Really?